I backtracked to one of my old TBR lists and finally read this one!! YAY ME!! Leene: I really enjoyed Eversea and the sequel. Sweet story, likable characters and the author writes very well! Michelle: yes I loved Eversea…checked my rating and I gave it 4 stars. The ending is CHish so you kinda need to get the second book to figure out where the story goes. 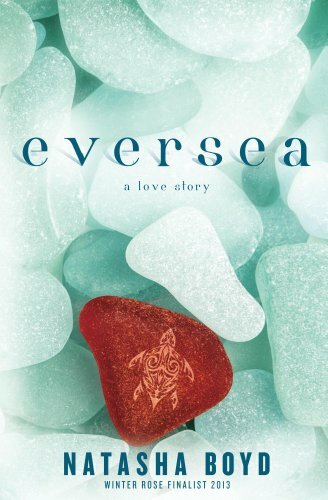 Cheryl: I loved Eversea and Forever, Jack. Not the level of angst of Thoughtless, but definitely some angst. …Eversea #2 is Forever, Jack and there is also a novella, Mistletoe & Hollywood: An Eversea Series Novella & A Desire Resort Series Novella. Both are good. Julie: OMG you have to read Eversea and Forever,Jack!!! Jean: Eversea…..I’ve had it on my TBR forever! Sigh…. Maryse: YAY Johanne!!! I MUST read this ASAP. My own sister is hooked!!! Susan: Which books are these??? Johanne: The books by Natasha Boyd : Eversea & Forever, Jack. Also bought My Star, My Love which is a short story. It’s worth it too to stay with characters. …so my mom saw my sister freaking and snuck-read it without even letting me know! Mom: I can’t wait until Jazz comes out! Mom: Jack Eversea… Jazz! Keri’s best friend. Me: Er… you read that series?? I haven’t even read that series! I didn’t even know who Jazz was. It’s her friend?? Mom: Yeah! Your sister was going on about it, so I had to know what all the fuss was about. So I read all three. They were gooood! You should read ’em. So I did. And they were right. Actually… y’all were right! I mean, they weren’t necessarily unputdownable (my mom agrees) but they were so darn fun to read. Lots of heart, and lots of my OWN emotions mixed right in with the bunch of ’em. It wasn’t that there was anything all that different in this “famous actor falls for normal girl” journey. I had zero excuses to continue hanging out with Jack Eversea. I had to head home. I also had to figure out how to stop referring to him by his full name in my head. …and then indulged us in the sweetest serenade. A tentative “trust” between a famous actor trying to stay on the down-low, and the one girl that doesn’t react like his fans do. She’s cool as a cucumber (although she’s shaking inside). But he feels he can trust her, and slowly lets her into why he’s hiding out in her small town. She helps him with his public needs (so he’s not discovered) and he helps her with her home renovation needs (’cause he’s a guy, after all, and he’s done this kind of work before he became a Hollywood heartthrob). It was just two AWESOME people, perfectly matched, becoming friends. And so much more. The author went everywhere I wanted her to go with this. Excitement at the prospect of meeting a star, right there before your very own eyes! Every girl’s ultimate fantasy. Not just meeting the guy that played the character of your daydreams, but also becoming close to the one that everyone wants to be close to. If I was honest with myself, it was all I could think about. I just couldn’t work out whether my feelings were about Jack the man or Jack the hot Hollywood actor or more specifically his character Max. I knew in part it wasn’t about Jack the man because, and I couldn’t kid myself about this, I hardly knew him. Part of me had to be projecting my feelings for a nonexistent perfect hero onto him. Impending drama and angst, due to his own obligations and entourage, (I mean… come on. You totally know where that’s gonna go, once their bubble has to burst… but I LOVED it). Cuddling and steam <— YES YES YES!!! ‘Cause, in their own personal and peaceful bubble, they are just two people, with pasts, and futures and fears, hopes and dreams, after all. And attraction beyond compare. And best of all… hilariousness! As in, her own friend’s reactions to OMG is that…??? . I turned around. Jazz was standing there, her mouth hanging open wide enough to catch a Frisbee. And so many more giggles!! Jazz was staring at me with her mouth open. I looked at her, probably with a similar look of dawning horror on my face. Yep! I can see why y’all are excited for Jazz’s book. She. Is. AWESOME. In fact, it is the character interactions, the dialogue, and the realistic scenes and reactions as the story unfolded that, even though this one was similar to others in the genre, made it its own. Made it one that as soon as I finished this one (what an ending!!) I absolutely wanted to start book #2. And I will. The minute I post this review, I’m one-clicking and starting it. Me: Well I just finished it mom, and it was exactly what you said. Not OMG CRAZY unputdownable, but I always wanted to pick it right back up. It’s similar to others, nothing tooooo crazy, or too different but I really liked it. Mom: *smirk* Start it now. And best of all? All of the released books in this series are on super-sale right now, in anticipation for Jazz. YAY ME!!!! DG: Question: the Eversea series….is it a 2 book and a novella series? Not a fan of waiting for the next one to come out…. Maryse: DG The Eversea series is complete (2 books plus a novella). The next book coming out is a spinoff for another character. Stephanie: Just read the Eversea series after I saw you mention it on your blog. It had some good angst and a few far fetched moments but overall I really liked it. Really looking forward to Jazz’ story. I’ve got an awesome cozy-angsty night ahead of me. I’m thrilled Natasha!! I was just going to read this last week, but then I DID squirrel, AGAIN! But, I just bought the 2nd book and novella yesterday, so definitely moving it back up! Maryse, I love that you have your mom and sister influencing you with your reading! That’s the best! I’m totally giggling over the back-and-forth with you and your mommy. Amy! I really did like Love Unscripted! Maybe because it was too long! Ha! What’s everyone reading this weekend? I’m still reading It’s All Relative (didn’t get to read much this week) and just got to the taboo part. Oh sh!t! I liked this series! It’s been a couple years since I read it. I might need to brush up on it before the spinoff comes out.